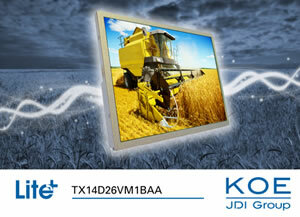 KOE Europe has announced the introduction of a new 5.7" QVGA (320 x 240 pixels) TFT LCD module. The new TX14D26VM1BAA is a further addition to KOE's expanding Lite+ product family. Lite+ modules offer cost effective LCD solutions that feature industry standard screen sizes, display resolutions and data interfaces but without any compromise in display optical performance. The new TX14D26VM1BAA provides a compatible upgrade for the existing KOE 5.7" TX14D22VM1BAA display module. The white LED backlight enables an exceptional brightness of 800cd/m² and an estimated half brightness lifetime of 40K hours. Contrast ratio is specified as 800:1. Applications such as ticketing machines, point of sale terminals and public information kiosks are often found in high brightness outdoor environments. The KOE Lite+ product line-up feature high brightness, long-life LED backlights and high contrast ratios to provide strong optical performance and display images that are clear, concise and able to be viewed under bright ambient light conditions. Mark Stephenson, Technical Marketing Manager, KOE Europe, said "The 5.7" display has been a de-facto industry display standard for many years and is used by a large and established customer base. We believe it is essential to maintain customer confidence and meet the needs of our customers by producing compatible, cost effective solutions for mature technology while still offering enhancements in optical performance such as improved brightness and contrast." A 40-pin CMOS interface supporting 6-bit RGB enables a colour palette of up to 262K colours. The 5.7" module has mechanical outline dimensions of 131.0mm (w) x 102.2mm (h) x 7.1mm (d) and an operating temperature range of -30°C to +80°C. Lite+ TFT displays are also suitable for medical, marine, process control, gaming and industrial applications.